The "Profile" frame contains a table with a list of input interfaces. After specifying interfaces it is possible to edit thicknesses of individual layers with the help of active dimensions. Adding layer is performed in the "New interface" dialog window. The z-coordinate of interface measured from the top of a structure (z) or thickness of layer (t) is specified. GPS coordinates - it is possible to show a structure on the Google Maps using "View on map" button after input of coordinates. 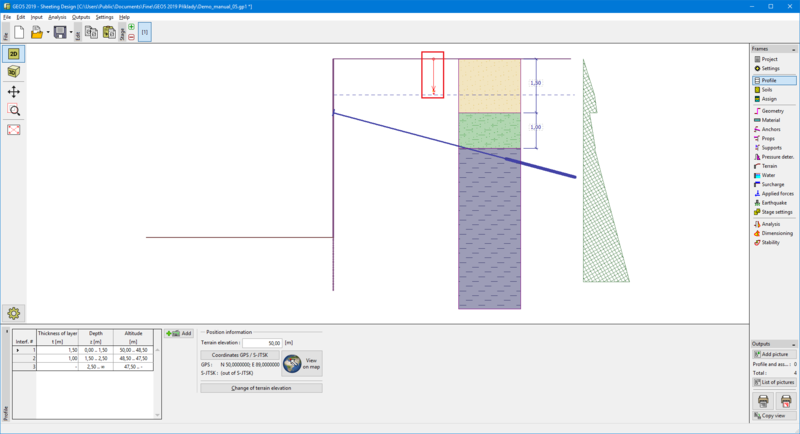 The program allows for raising or lowering the top point of a structure in the "Change of terrain elevation" dialog window so that the whole interface can be translated while keeping the thicknesses of individual layers. This function is important when copying the profile from program "Terrain" or "Stratigraphy".